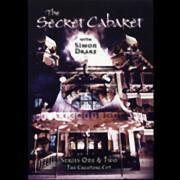 This is the 2nd in a newly released series of Patrick Page – Magic Gold DVDs. Patrick Page was probably the best magician in the world using the topit. The secret of using of course was that people did not realise that it existed. In this DVD learn how to use a topit successfully and make ordinary objects such as salt cellars, wine glasses, packs of cards, lighters, cigarette packets vanish and appear at will. Spectators are impressed by ordinary every day items that they have seen and used disappearing in front of their eyes. The topit is possibly the most useful magic accessory for a working magician. We sell topit vanishers separately. Patrick Page Masterclass DVD – The Topit Vanisher. This DVD contains everything that you need to know about using the Topit Vanisher. 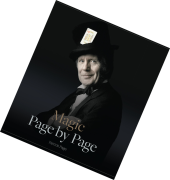 The legendary magician, Patrick Page was recognised as one of magic’s leading authorities on the Topit and its uses. In this DVD, originally filmed for Trik-a-Tape, he gives you a complete masterclass on this versatile prop. Filmed in a studio, he shares his secrets with you on performance technique, vanishing, switching and much, much more. Patrick Page used a Topit regularly for more than 50 years and in this DVD, he shows you that this classic gimmick is capable of infinite possibilities to simplify and improve your magic. The Topit Vanisher DVD is priced at £12 (approx US $16) inclusive of free worldwide postage and packing (shipping). It is sent to you by first class post. Please make payment by Paypal. The DVD is a Pal version for use on Pal tv systems but we should work on most computers. We have had positive feedback from customers in the USA who have told us that the DVD works on both Personal Computers (PCs) AND Macs. A Patrick Page De Luxe Topit Vanisher is also available from Patrick Page Magic. See elsewhere on the Products / Magic Effects page. 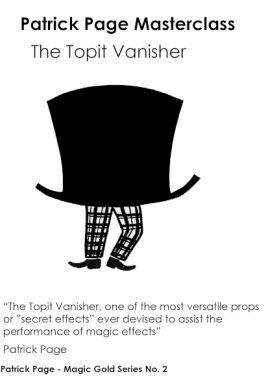 More information on the use of the Topit Vanisher is included in the Magic Page by Page Book available exclusively from Patrick Page Magic.